What Is The Best Food For Young Athletes? What should your young athletes eat for a healthier season? Back to school also means back to sports for many children and teens. If your children take part in an after-school sport or play on a rec league team, you can help fuel their performance and keep them healthier by providing them with a nutritious diet tailored for their higher activity level. So what should young athletes be eating? Why is good nutrition important for young athletes? 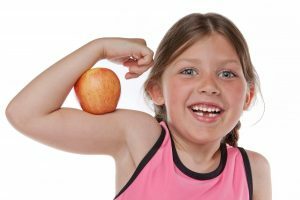 Of course, all children need a healthy diet that includes protein, whole grains, fruits, vegetables, low fat dairy and healthy fats, but young athletes also rely on food to fuel their performance and support their metabolism and tissue growth and repair. Depending on how demanding the sport is and how long your children practice and play each day, they can require 12 to 15 percent more calories a day than a child who is primarily sedentary. Fiber-rich complex carbohydrates are used by the body to create energy, especially fuel for the muscles. Healthy carbohydrate choices include whole grain bread and pasta, brown rice and other grains such as quinoa, oatmeal, fruits and vegetables. One of the benefits of complex carbohydrates from whole grains, fruits, vegetables and beans is that they contain fiber, which means they are absorbed by the body more slowly and can help avoid blood sugar spikes that can leave your child feeling tired or sluggish. Protein promotes cell growth and repair. Good protein sources include lean meats, cheese, eggs, fish, nuts and beans. Healthy fats are important because they transport nutrients including vitamins A and D and are part of the cell wall in all the body’s cells. Nut butter, olive oil, seeds and nuts and avocados can provide the needed fats. Vitamin and mineral-rich foods like darky, leafy greens, sweet potatoes, oranges, strawberries, carrots, cantaloupe, red bell peppers, black beans, bananas, low-fat dairy, chicken, beef and salmon do several jobs in the body. They support the immune system and bone development and, especially important to athletes, convert carbohydrates into glycogen, which fuels muscle performance. It’s also extremely important for your young athletes to stay properly hydrated, so they should drink before, during and after practice and games. Water is a good choice for hydration throughout the day. Other choices for hydration during practice and games include 100 percent fruit juice and, if they’re practicing or playing for more than 60 minutes or working out in a hot climate, sports drinks that replenish the sodium and potassium lost through sweat. Your children should eat a healthy pre-game or practice meal 2 to 4 hours before they exercise. That timetable gives the body adequate time to digest the food and convert it into energy. Younger athletes may also need a mid-game snack like whole fruits such as oranges or grapes. Right after practice or a game, your children should eat a snack that includes fresh fruit, whole grains and some protein, such as a sandwich made with whole grain bread and lean meat or nut butter or whole grain cereal with milk and fruit. If you’d like guidance on how to ensure your children are getting the nutrition they need for a healthy sports season, talk with your pediatrician or work with a health advisor to get objective information and advice from an experienced nutritionist.